The freezing Seattle cold made Eagan McHale's words come out in short puffs of steam. With no one within listening range, he added a chorus of curse words just for the heck of it. He wasn't a happy man and saw no reason to pretend otherwise. Even his fangs ached from the cold air. When he ran out of obscenities, he started listing all the things he hated: his boss for forcing him do this job on his own, the cold for making him miserable, and the twinkling Christmas lights just because. And, oh yeah, he hated anyone who would prey on young teenagers. Lately, several young men in this area of Seattle had been reported missing, and no one knew how many of the runaways had also disappeared. Down the street a moth-eaten Santa rang his brass bell for all he was worth. Eagan took perverse pleasure in the obnoxious sound it made. Bells were supposed to chime; this one clunked. It suited his mood, so he dropped a twenty in the old elf's bucket and kept walking. The next turn brought him back to where he'd begun. For what seemed like the hundredth time in the past three nights, he paused to stare at the late-night diner across the street. Originally, it had drawn his attention because it looked way too warm and cozy, two things he usually avoided. Red-checkered tablecloths and lace curtains made his skin crawl, but tonight he'd put up with them if it meant he could get warm. The place certainly drew an odd mix of people. Some were holiday shoppers. Others probably had trouble scraping together enough change to buy a cup of regular coffee much less the lattes advertised in the diner window. There were even a few non-humans mixed in the bunch. As usual the regular folks were blissfully unaware that some of their neighbors drank blood for dinner or sprouted fur and fangs come the full of the moon. Right now the real object of his interest was standing at the counter and smiling at a pair of teenagers who'd just strutted into the diner as if they owned the place. Eagan recognized trouble when he saw it and automatically reached for the gun stuck in the waistband of his jeans. At the first sign of violence, he'd charge across the street to save the day even if it blew his cover. The lieutenant was already mad at him; one more transgression wouldn't make much of a difference. But in a matter of seconds, the diner's owner had the two punks sitting at the counter with big sloppy grins on their faces and two hot drinks and pie in front of them. Problem solved. Amazing. He would've bet on the pair being armed and after some fast cash. He didn't yet know the owner's name, only that she had a smile for every customer who walked through the door. As if sensing his gaze, she glanced in his direction. He swore he could feel her warmth all the way across to where he stood shivering in the cold. Tamping down his brief adrenalin rush, Eagan considered his options. Maybe he should've accepted the flask his two-natured partner Duncan had offered him before leaving the precinct house. A stiff shot of straight whiskey would taste good about now, a bit of antifreeze for his veins. He could make another lap around the block and hope that would warm up his blood while he hunted for any sign of his target's presence in the area. Or he could simply call it a night. He glanced across the street again. Okay, so there was another option. Without even realizing he'd made a decision, he stepped off the curb and headed straight for the diner door. 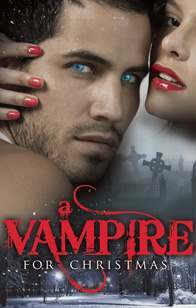 "In the new anthology, A Vampire for Christmas, . . . sometimes a vampire is just what a girl wants Santa to bring her for the holidays." Marlene Harris, Reading Reality. Night Owl Reviews top pick and quote for A Vampire for Christmas: "a sizzling and passionate romance that comes to life between Della and Eagan so strong that it cannot be ignored no matter how hard he tries. And truth be told, the searing kiss shared between the two is the best kiss I've ever had the pleasure of Reading!" 4 1/2 Stars, Night Owl Reviews, TOP PICK!